The UK government and EU agreed a flexible extension (flextension) to the Brexit negotiation process last week, which avoided a “no deal” Brexit, which would normally be expected to be positive for the Pound. However, Sterling has been paralysed with muted directional progress versus the UD Dollar or Euro since the extension was agreed. This has likely reflected the threats of a change of leader with the governing Conservative party, a potential new General Election (and possibly a Labour Part y Government) or another referendum. 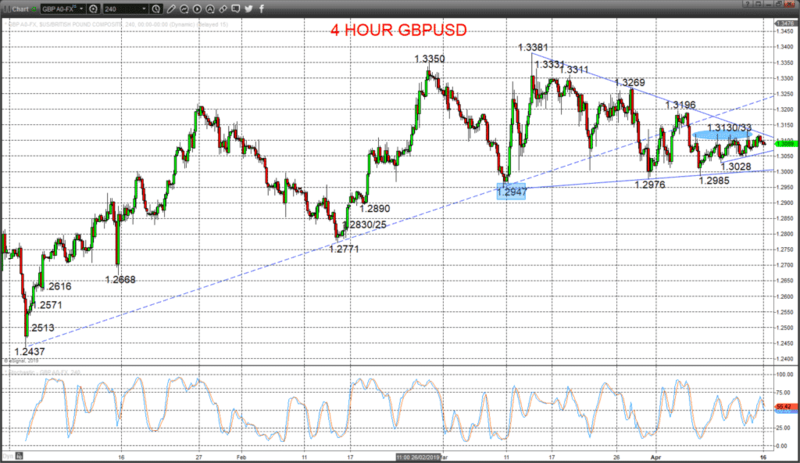 GBPUSD has been caught within a narrow band for the past week (1.3028 to 1.3133), with a slight bias to the downside. A small rebound and Monday but still capped by 1.3133 after Friday’s failure from here (just above our 1.3122/30 resistance area), to leave a negative bias and to just keep risks back lower for Tuesday.